After the success of The Terminator and Aliens, writer-director James Cameron and his producing partner (and wife) Gale Anne Hurd had options. 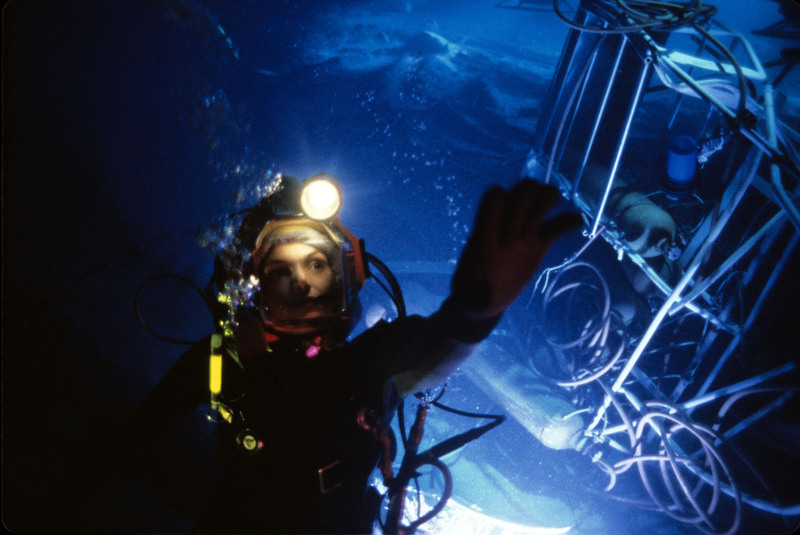 Given their choice of projects, they decided to develop an idea Cameron had carried with him since his teen years: an adventure set in the deepest reaches of the ocean floor. Science fiction and the ocean were among Cameron’s abiding interests. (And they remain so.) 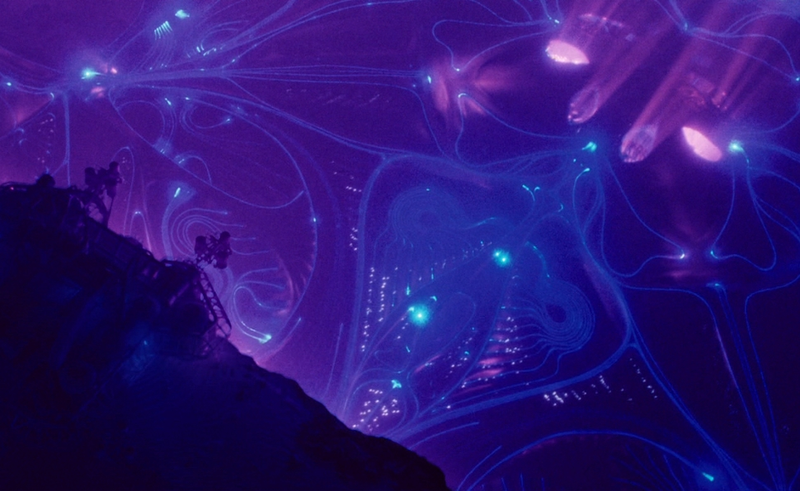 With The Abyss, he sought to combine them via a story that combined real-life science about the wonder and difficulty of exploring the deep, and an alien encounter that raises philosophical questions about humanity’s future. Factor in a central relationship between an estranged married couple who have to maintain a professional relationship while overcoming their differences—Cameron and Hurd separated during the film’s pre-production, and divorced before its release—and you have the makings of a deeply personal film, however grand its scale. And the scale of The Abyss could hardly be grander: To simulate bottom-of-the-ocean conditions, Cameron and his crew created a pair of large underwater tanks at an abandoned South Carolina nuclear facility. Working in an unpleasant-sounding mix of water, milk, and walnut shavings—a combination chosen for its photographic qualities—the cast did as many of their own underwater stunts as they could, in the name of verisimilitude. The scene of Ed Harris swimming with Mary Elizabeth Mastrantonio’s unresponsive body in tow, to choose just one example, really is Harris and Mastrantonio. Even shooting out of the tank was no easy feat, with large chunks of the film requiring the cast to wade around sets that had been filled with water. That’s to say nothing of the film’s elaborate, ultimately Oscar-winning special effects, which employed everything from models to puppets to groundbreaking CGI. Few productions this side of Fitzcarraldo have had a comparable level of difficulty. And then hardly anyone went to see it. Released on August 9, 1989, the film earned $9.3 million in its opening weekend. That was enough to put it ahead of the weekend’s other big release, A Nightmare On Elm Street 5: The Dream Child, but not the week-old Parenthood. The film was released on a Wednesday, and its weekend take doesn’t include Wednesday/Thursday box office, but it still isn’t good. Though The Abyss ended up earning $54.2 million domestically—finishing the year behind Pet Sematary and just ahead of Star Trek V—it was still a financial disappointment. The Special Edition is aptly named. Like Steven Spielberg’s “Special Edition” re-release of Close Encounters Of The Third Kind, this is less an instance of a filmmaker restoring a film to his original vision than finishing a job he felt was left undone the first time around, especially a finale whose effects could not be completed to his satisfaction. But it’s also something of a restoration as well. 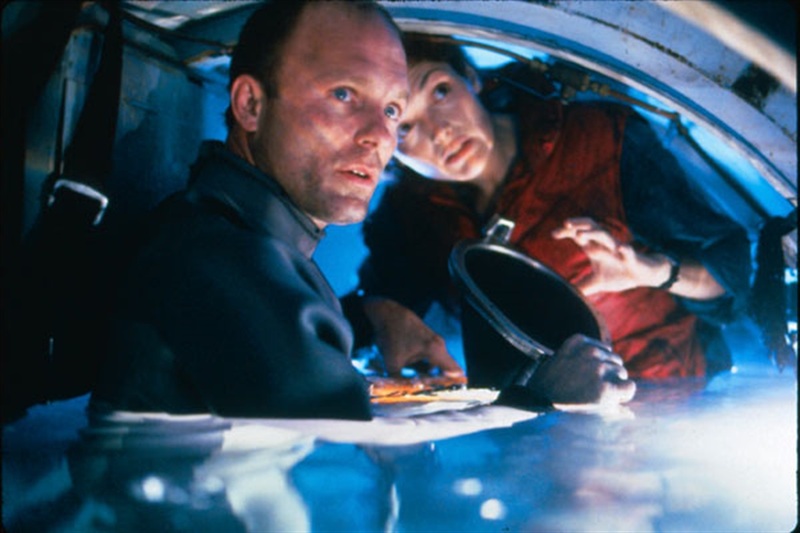 Cameron had final cut on The Abyss, but didn’t want to deliver an overlong film. In the 1992 documentary Under Pressure: The Making Of The Abyss, Hurd says, “[a]t the time, any film over two hours and 10 minutes was an enormous gamble.” Operating under the same logic, Cameron takes responsibility for the cuts made before The Abyss saw theaters: “The handwriting was on the wall. We had to cut the picture down.” It was, in short, a commercial decision, albeit one made by the filmmaker, not the studio. Not long after the release of The Abyss, however, Dances With Wolves helped proved that modern audiences could sit still that long, and each subsequent Cameron feature has been longer than The Abyss, with Titanic clocking in at more than three hours long. Though the poster made The Abyss look nearly indistinguishable from Deep Star Six and Leviathan, is anything but another Alien rip-off set beneath the waves. It does, however, borrow a bit from Cameron’s Aliens. Set among deep-sea oil workers, it aspires to achieve the same hard-working, rough-talking, deeply affectionate camaraderie that made Aliens the gold standard for supporting casts. It doesn’t entirely get there, in this version at least, but it does tell a compelling story anchored by the estranged couple at its center. The film opens with unexplained sinking of the U.S.S. Montana, a nuclear submarine that runs into… something near the Caribbean’s Cayman Trough. To salvage the sub before the Soviets can reach it, the military calls on Virgil “Bud” Brigman (Harris), commander of the underwater oil-drilling platform Deep Core. Drawn by the promise of triple pay, Bud’s crew signs on for the job. They’re joined by a group of Navy SEALs—led by the hulking, mustachioed Lt. Coffey (Biehn)—and by Lindsey (Mastrantonio), the platform’s straight-talking, assertive designer, who also happens to be Bud’s wife. Because they’re in the process of divorcing, neither welcomes the reunion. Reaching the Montana, the Deep Core crew and their guests have the first of several hard-to-explain encounters with what look like glowing jellyfish, while above, a hurricane brews, lending an added urgency to their mission. Coffey, who’s starting to have a mental breakdown due to a negative reaction to the literally high-pressure conditions, follows orders to retrieve a nuclear warhead from the Montana as a bargaining chip. When contact with the surface fails, his crumbling psyche leads him to assume the worst, jeopardizing both the lives of everyone aboard and their first contact with what they dub “NTI”s: non-terrestrial intelligence. With each NTI encounter, Cameron shifts modes, moving from a swift tale of survival under the seas—made all the more tense by the long, Steadicam shots that capture the situation’s claustrophobia—to Steven Spielberg-inspired displays of wonder. For a while, the two live side by side better than first reviews of The Abyss suggest. Always an economical storyteller, Cameron neatly lays out the mounting peril Deep Core faces, and the stakes of each situation as that peril shifts. All the while, he never loses track of his characters, especially Bud and Lindsey. As the film progresses, their marital woes and possible reconciliation shift from background noise to center stage, particularly once the film strands them in a remote vehicle together with only enough oxygen for one to return to Deep Core. The subsequent sequence in which Lindsey, at her insistence, lets herself drown and be carried back to Deep Core under the faint hope that she can be revived is the film’s most powerful, and among the most moving scenes of Cameron’s career. Even if The Abyss had nothing else going for it, that sequence would justify the film’s existence. It’s what happens next that caused many to view the film’s existence as needing to be justified. In order to defuse the warhead, Bud plunges deep, deep into the trench, knowing the likelihood of him making it back is slim. As he runs out of oxygen, he’s rescued by an NTI, which takes him to a wondrous mothership on the ocean floor and replays his final message to Lindsey. Apparently the aliens admire his self-sacrifice. From there, the NTI ship lifts everyone back to the surface and a happy ending is enjoyed by all, as humanity and aliens meet for the first time. The end. And… commence head-scratching. There’s a tough-to-shake feeling of is-that-all-there-is? to the finale of The Abyss. Did we plunge that far down just to see a light show and some friendly aliens? It doesn’t help that the design of the aliens and their ships looks more tacky than wondrous. While the encounter with the pseudopod aboard Deep Core feels truly new, the film’s ultimate reveal plays like Close Encounters Of The Underwater Kind. “If I couldn’t do what 2001: A Space Odyssey did for science-fiction films taking place in space… then I didn’t want to make the movie,” Cameron recalls in Under Pressure. That’s an impossible standard, of course. And while it’s clear that The Abyss’ final act has the end of 2001 in mind, even in the theatrical cut, the film washes up in a much more mundane place. Then again, some of the greatest strengths of The Abyss in either cut are mundane. That’s especially true of the Special Edition. Here, the supporting cast has more room to come to life, and the crew of the Deep Core resembles a family bonded by their difficult situation. Two characters in particular benefit from the added time: Hippy (Todd Graff), a conspiracy theorist with a pet rat, and One Night (Kimberly Scott), a crew member whose protectiveness of Bud, and lack of fondness for Lindsey, gets more screen time here. In fact, with one major exception, most of the Special Edition’s additions come in the form of small moments here and there that add shape and shading: The crew singing along to a Linda Ronstadt song, Bud recounting how he ended up married to Lindsey in the first place, exchanges that capture the mounting tension between Bud and Coffey, while doubling as demonstrations of how deeply Bud cares about his crew. What emerges is a much fuller depiction of life at the bottom of the ocean, one that makes it easier to care about each character’s fate. Lindsey and Bud’s relationship gets more screen time, too. The scene in which Bud throws his titanium wedding ring in the toilet, then retrieves it seconds later is now preceded by a fight that better explains his frustration. (Later, the ring saves his life by stopping a door. Cameron is never particularly subtle about his symbolism, but he uses it effectively.) The added scenes make the film’s strongest element even stronger. But can the same be said of its weakest elements? Most of the Special Edition’s major additions arrive in the finale, but they’re set up early in a scene that positions this version to turn into a much different movie than the theatrical cut. In both versions, the Deep Core crew watches a television broadcast noting that the Montana’s disappearance could increase tensions between the U.S. and the U.S.S.R. While the theatrical cut lets this drop, the Special Edition runs with the idea. As the hurricane builds, so does a full-on global crisis that threatens to erupt into World War III. 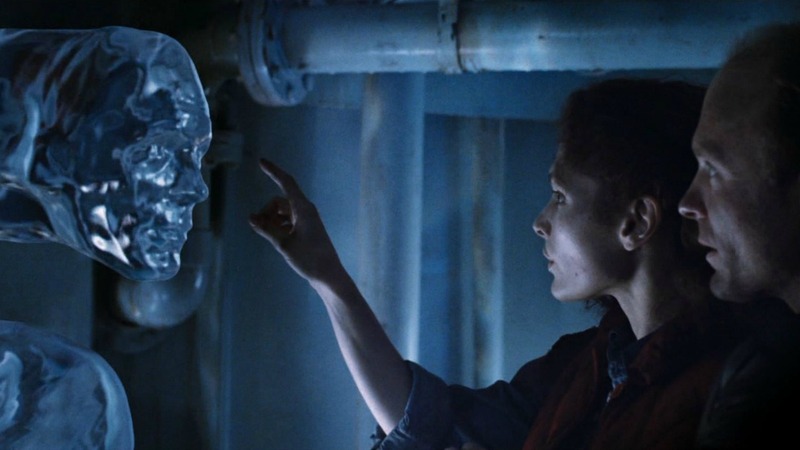 The Abyss becomes not just a small story about the life-and-death struggle of an oil-rig crew, but a story about the survival of the planet itself. Bud’s encounter with the NTIs only confirms this. Once he’s rescued, he’s shown footage of the thousand-foot tidal waves that have risen just outside New York, San Francisco, an unnamed Russian port, and other global locations. Those waves are holding in place, as if waiting for orders. The implication: The NTIs are perfectly happy to wipe out humanity. Why? As an answer, Bud is shown a greatest-misses montage of 20th-century atrocities, from Hitler to Vietnam. What’s stopping them? Bud is again shown his act of self-sacrifice. But here, it’s a justification for saving not only him, but the human race itself. This is a tough call. The additional character work makes the Special Edition a superior film, but it also means accepting the new humanity-on-trial-via-stock-footage ending, which introduces problems not found in the original version’s ending. Cameron’s inability to complete the tidal-wave shots to his satisfaction in 1989 influenced his decision to cut them. By 1993, effects had advanced sufficiently to meet his standards, but they still look a little cheesy. Going with the Special Edition means swallowing a certain amount of cheese, visual and otherwise. And yet it’s the superior cut, the one in which Cameron’s 2001 aspirations are most evident, even when they don’t work. The Special Edition draws from the tradition of Golden Age science fiction and films like The Day The Earth Stood Still, stories that used aliens and cutting-edge technology to explore the Big Questions of where we came from and where we’re going. The Abyss’s Special Edition arrives at frustratingly simple answers—“Hey! Let’s be nice to each other!”—but it gets points for asking anyway. And even though it whiffs the ending, what comes before looks even more remarkable than in the theatrical cut, drawing out the humanity beneath the film’s technical ambition, watching as characters press on in spite of doubt, the overwhelming odds, their fragile bodies, and their even more fragile hearts.